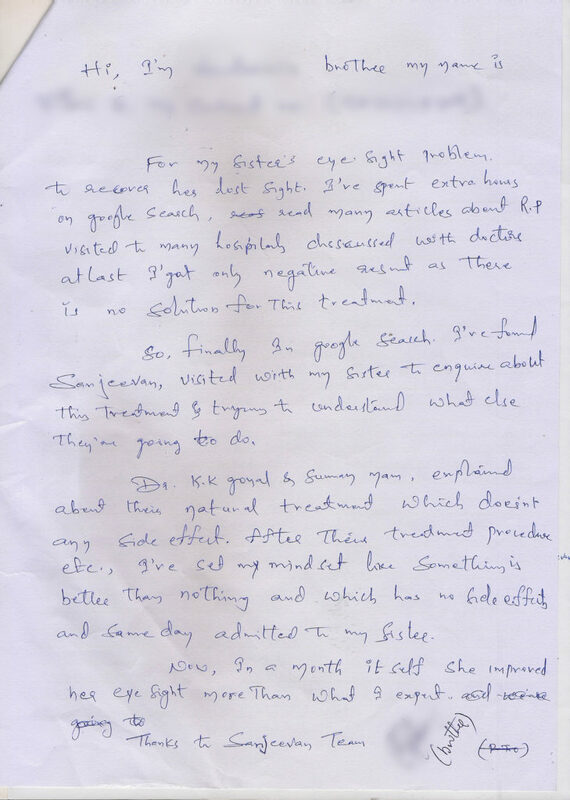 I, Saurabh suffering from Retinitis Pigmentosa since last 6 years. And I have not found any treatment for my problem. Then, I came to Sanjeevan. 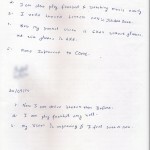 After joining Sanjeevan For Perfect Eyesight my vision got improved by doing treatment regularly. Now I am able to walk without my glasses and also my overall eye health increased. 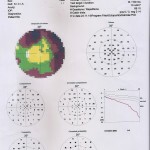 I, Sunil suffering from Retinitis Pigmentosa since last 6 years. And I have not found any treatment for my problem. Then, I came to Sanjeevan. 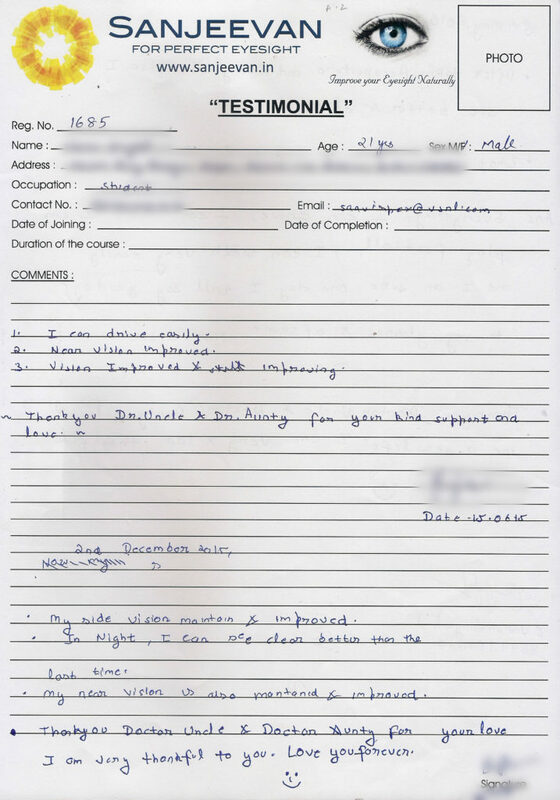 After joining Sanjeevan For Perfect Eyesight my vision got improved by doing treatment regularly. Now I am able to walk without my glasses and also my overall eye health increased. I Sagar Bansod suffering from Retinitis Pigmentosa. I started my treatment at Sanjeevan For Perfect Eyesight in Chembur. 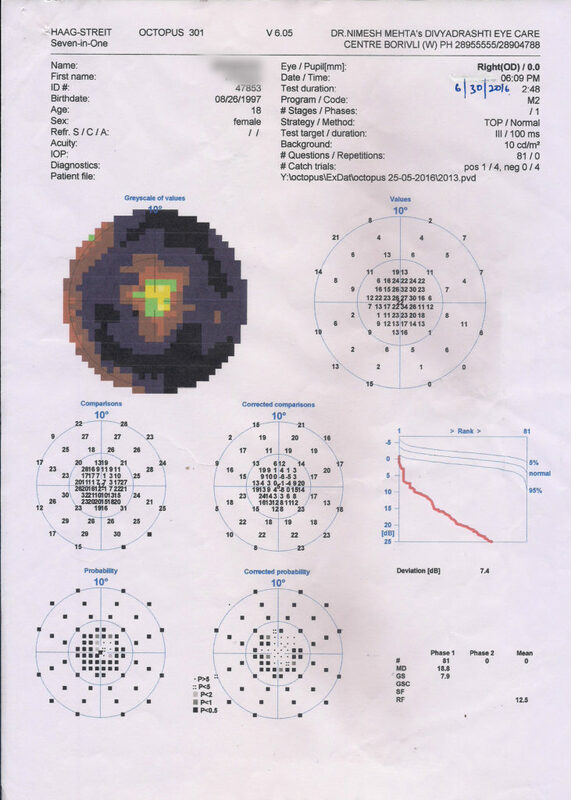 During the treatment, I found there was lot of improvement in my right eye. Now I am confident to do computer work in my office. This is yet another day of my treatment being taken for Retinitis Pigmentosa. I had completed at least 9th session of the Acupuncture. Yesterday when I went to my elder brother’s resident at Meera Road and he saw my activities, he told me that “Sagar” you have now more confident in walking alone now, as compare to your early days. Yes I also feel very confident in my work.Thanking You. 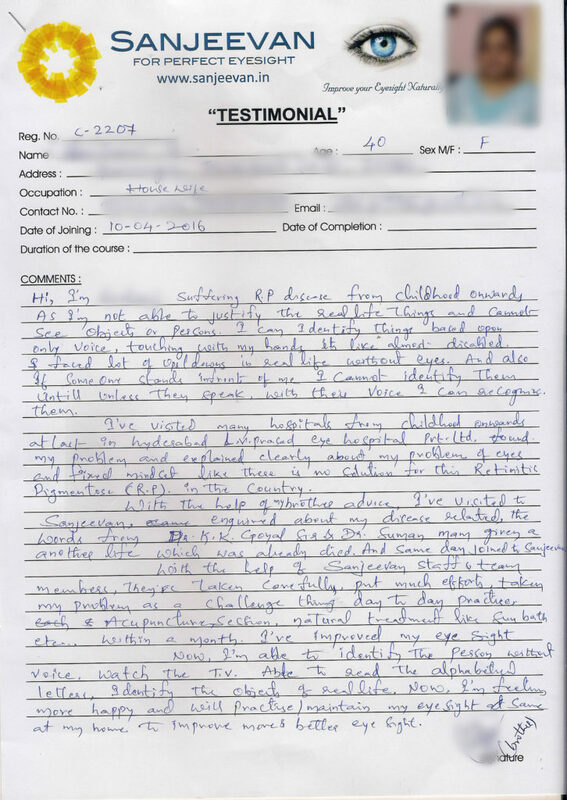 I Ms. Zia Uddin Zia, aged 25, had an accident by a bamboo stick which damaged retina of my left eye in 2005, in 2009 I had gone through a seleral bucking for detached Retina. Doctors said that there is no possibility of vision improvement in the left eye. So I found Sanjeevan through internet. Here, Dr K.K Goyal Sir and Dr Suman Goyal ma’am said the opposite, they added the definitely word. This made me hopeful. So I started taking treatment from Sanjeevan. 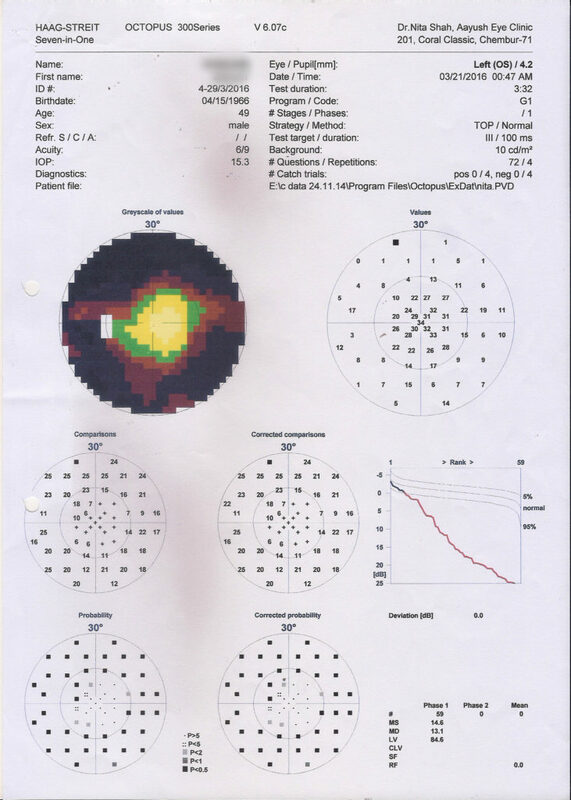 After 12 days my Vision improved from 6/Nil to 6/60. Thank You all of Sanjeevan Team. 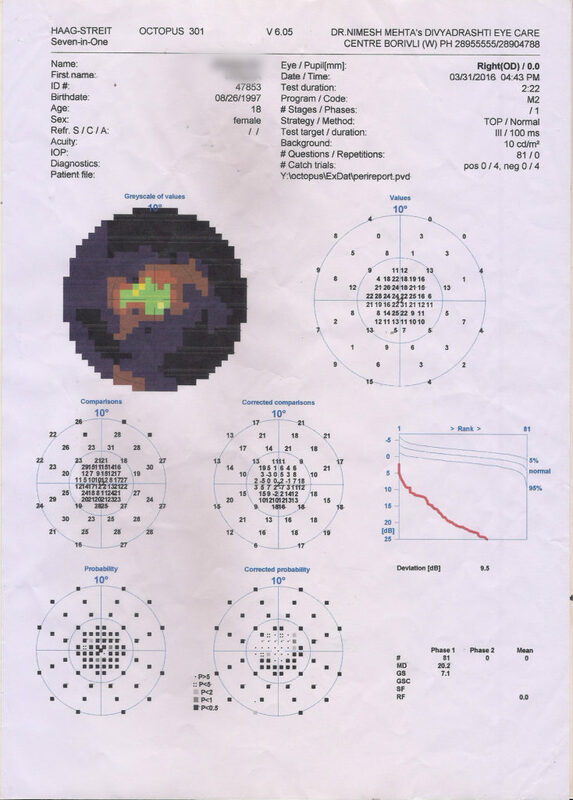 I Consulted Dr Goyal for my Retinitis Pigmentosa problem. It was a great experience. I wish all the Doctors and Clinics work the way these guys do. Always Responsive and willing to help. I was really pleased with my Professionalism and Care. Dr. Goyal, Suman Madam & Dr Rohan all are the best doctors. I appreciate their followup and willingness to answer questions. From the very first day I am feeling and noticing the changes in my vision. Coming here is like dealing with a trusted family. Since birth I have been living with Retinitis Pigmentosa, Cone-rod-distrophy and Colour Deficiency. 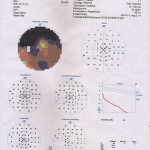 I was diagnosed in 2005 till now I had trouble with distance Vision, Reading, Peripheral Vision and Night blindness. But now after first few Electro-Acupunture and exercise Sessions, I have noticed improvement in Peripheral Vision, Distance Vision, Reading and Travelling in dim and night situation. 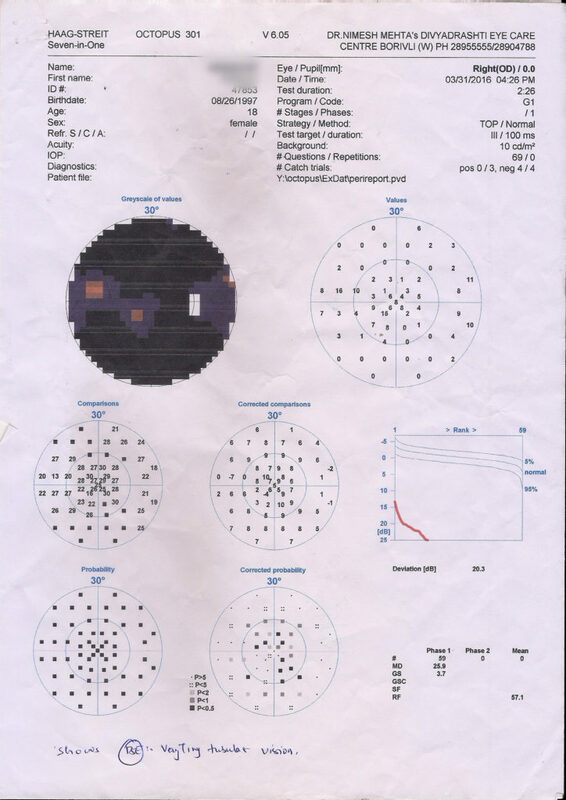 Here the place have given me how to keep my eyes in rest, how to improve the vision. I felt slight better improvement in reading. I do feel this treatment will solve my RP Problem. I sincerly thank you all,The Doctor,The Staffs and all other Faculties for their Kind Motivation. Before when I had visited Sanjeevan I was facing problem in sunlight to focus on an object. My vision was also very poor in the beginning. But after joining Sanjeevan I have started seeing improvement. My vision has also improved in 5 days. 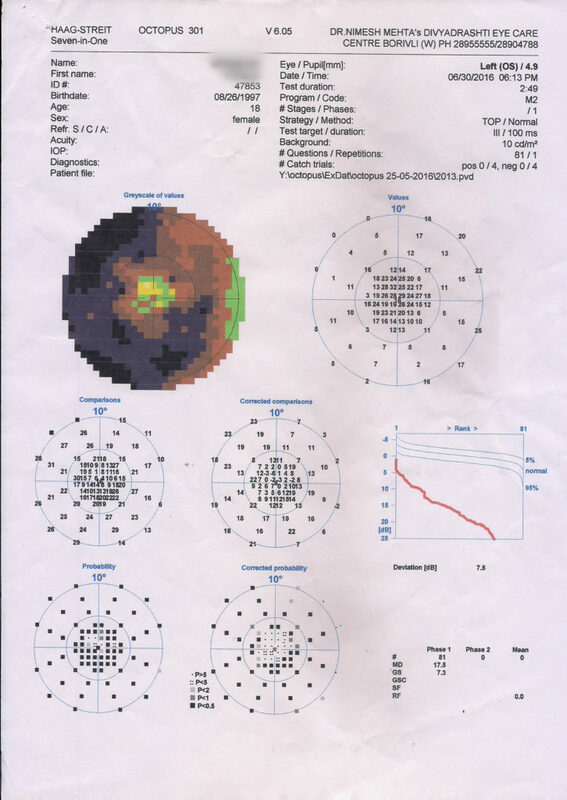 On my first checkup my colour vision was also very bad but after 15 days of my treatment my colour vision was much better from earlier. Even I had problem of dry eye but now after the treatment I am not facing any problem of dry eye. 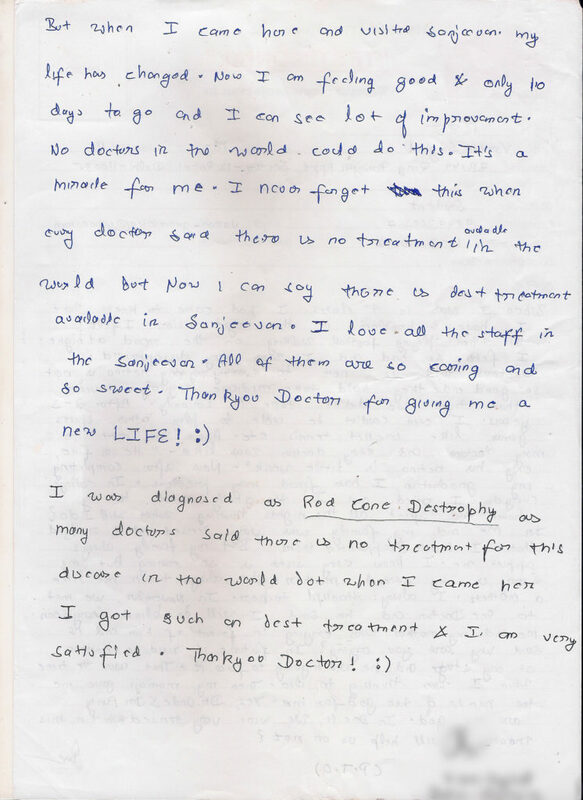 I am Nandini from Tanjauur, I am suffering from Cone rod Dystrophy (RP). Before I was not able to read the board, I slipped many times while walking, I was not able to identify colours. This problem destroyed my daily life. Many Doctors told me that this problem cannot be cured. I was heart broken then 1 day I was searching in youtube for this treatment then I came to know about Sanjeevan Hospital. I decided to visit here. I consulted in Sanjeevan, here Dr’s assured me that this problem is curable that also Naturally. I decided to start my treatment. 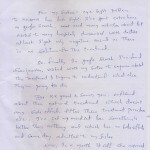 After completing one session of treatment, I was able to read letters which it was not at all possible before. Before I was not at all able to see from my right eye, but now my right eye have little vision. I am able to focus on an object now and can identify things. I can even identify colours now. I am trying to walk alone now, without the support of my mother. I thank each & everyone behind the progress. I am Anuradha & I am suffering from Retinitis Pigmentosa problem. This is my second visit to Sanjeevan. My vision is improving. Now I am able to read all the lines in 6/12 within 6 months. Earlier I was not able to read even a single line, but after my first visit I started reading 4 lines and now in my second visit one more line is improved. Even my night vision has impoved in this visit. I am thankful to Ma’am fo her patience & suggesting me to improve my vision habits. I Thank Dr Rohan Sir who gave me a diet (Tips) recommendations to improve my eyes and make them healthy. I thank everyone in Person for taking care of me. 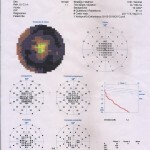 From 6 years I am suffering from Retinitis Pigmentosa. In this I was not able to see properly in the night and also lost my peripherial vision. After visiting many Doctors,I have not found any treatment for RP. Then I read about Sanjeevan For Perfect Eyesight and decided to visit. After visiting here I started doing prescribed treatment. 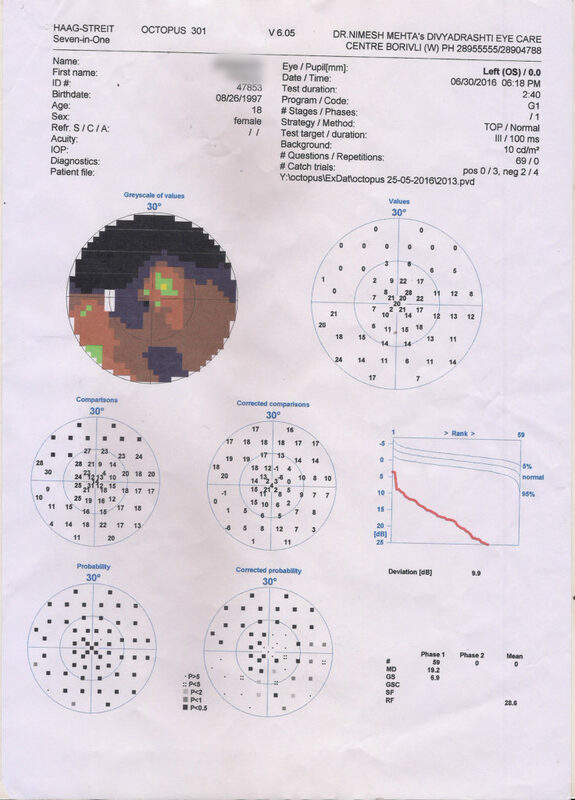 After 20 days of continue treatment it felt difference in my vision. My periphere vision started improving. Also I can walk and sit alone without glasses and that’s a major improvement for me. Thanking each and everyone. 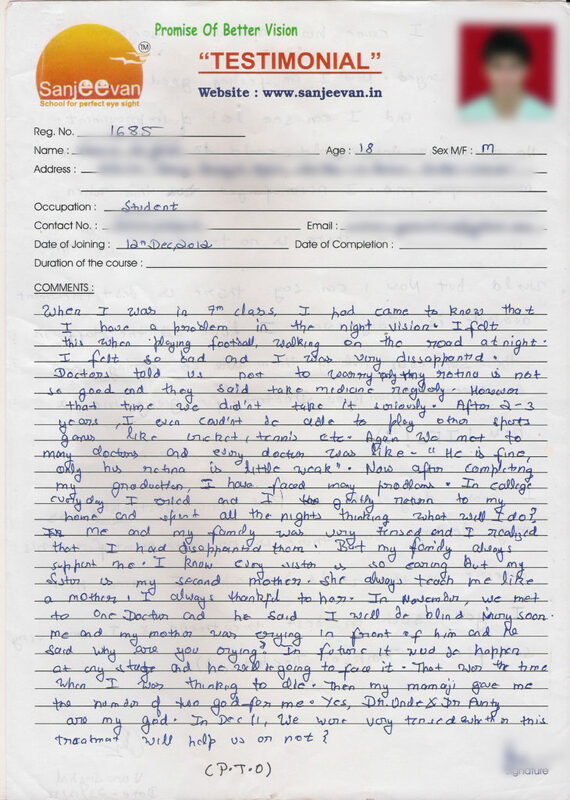 I Fahim Ayaz suffering from MD & RP, after completing the course of 15 days of my first visit at Sanjeevan, I found a little change in my near vision. On my 1st day of my treatment I had read only 3 lines of the chart but now after the treatment I can read almost all 6 lines of the chart. So I am very happy and thankful to Sanjeevan for this change in my vision. I Hasina Ahmed, suffering from Retinitis Pigmentosa and Macular Degeneration. When I got to know about this problem, I started searching solution & treatment. 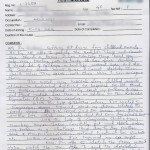 But I did not got any proper treatment & I was badly disheartened. But when I searched online, I found a institute name Sanjeevan, which is treating the same eye problem I am having. Then I left for Bombay for the treatment. After conversing with the doctor I decided to treat over here. Slowly & gradually with the Natural Treatment given over here my vision improved. Before I was not able to identify things and objects around me but now with the treatment its improving my eyesight. Even i found that O can read the letters which I was not at all able to do earlier. I Thank everyone who helped me improve my eye vision. 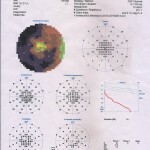 I am suffering from Retinitis Pigmentosa since 2009. I had gone through many tests & medications all over India. Finally we approached Sanjeevan and I found good improvment in reading within 15 days of span. It gave me a good hope and I have decided to continue the course and nutritional suppliments prescribed here. I enjoyed doing the sessions and its really helpful in improving the eyes. All the staff were co-operative. Thank you each and everyone in person. 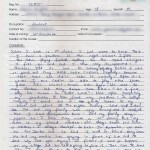 Hi, I am Varalaxmi suffering from R.P from childhood. As I am not able to justify the real life things and cannot see objects or person. I can identify things based upon voice, touching with my hands it’s like almost disable. I faced lots of ups and downs in real life without eyes. And also if someone stands in front of me I cannot identify them until and unless they speak. I’ve visited many hospitals from childhood onwards at last in Hyderabad L. V. Prasad eye hospital Pvt. 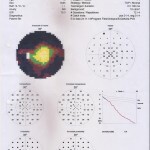 Ltd,found my problem and fixed mindset like there is no solution for this Retinitis Pigmentosa (RP) in the country. With the help of my brother’s advice, I’ve visited Sanjeevan, enquired about my disease, the words from Dr. K. K. Goyal sir & Dr. Suman Mam gave another life which was already dead. And same day I joined Sanjeevan. With the help of Sanjeevan staff & team members, They take care and put much efforts and took my problem as a challenge things day to day practice, Acupuncture session, natural treatment like sun bath etc.. within a month I’ve improved my eye sight. Now, I’m able to identify the person without voice, watch the T.V able to read the alphabets, identify the objects of real life. 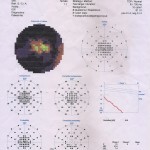 Now, I’m feeling more happy and will practice and maintain my eyesight same at my home to improve more & better eyesight. 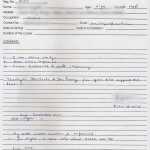 Hi, I’m Varalaxmi’s brother my name is Vilas G.
For my sister’s eyesight problem to recover her lost sight. I’ve spent hours on Google search, read many articles about R.P visited many hospitals discussed with doctors at last I got only negative result as there is no solution for this treatment. So, Finally through google I found Sanjeevan, I visited with my sister to enquire about this treatment & tried to understand what they do. Dr. K. K. Goyal & Suman mam, explained about their natural treatment which does not have any side effect. After their treatment procedure etc, I’ve set my mind set like something is better than nothing and which has no side effect and same day registered my sister. 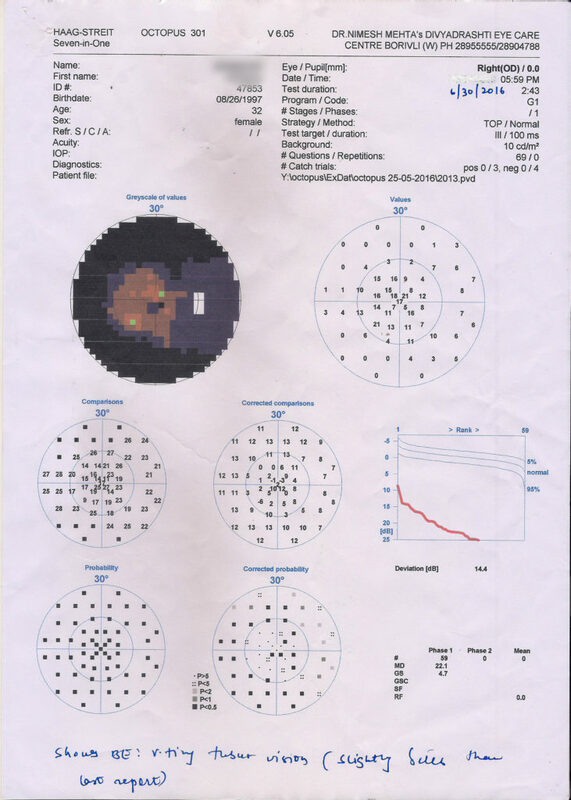 Now, in a month itself she improved her eyesight more than what I expected. When I was in 7th class, I came to know that I have problem in the night vision. I felt this when playing football, walking on the road at night. I felt so bad and I was very disappointed . Doctors told us not to worry only the retina is not so good and they said take medicine regularly. However that time we didn’t take it seriously. After 2-3 years, I was not able to play other sports games like cricket, tennis etc. Again we met the doctor and every doctor was like “he is fine, only his retina is little weak”. Now after completing my graduation I have faced many problems. In college everyday I tried and I gently return to my home and spent all nights thinking what will I do ? Me and my family was very tensed and I realized that I had disappointed them. But my family always supported me. I know every sister is so caring but my sister is my second mother. She always teaches me like a mother. I am always thankful to her. In November we met one doctor and he said I will be blind very soon, me and my mother were crying in front of him and he said why are you crying. In future he is going to face it.That was the time I was thinking to die. Then my uncle gave me the no. of two god. Yes, Dr.Uncle & Dr. Aunty are my god. First we were very tensed whether this treatment will help us or no. But when I came here an visited Sanjeevan. My life has changed now. I am feeling good & only after 10 days I could see improvement. No doctors in the world could do this. It’s a miracle for me. I can never forget when doctor told there is no treatment in the world but now I can say there is treatment in Sanjeevan. I love all the staff in the Sanjeevan. All of them are so caring and so sweet. Thank you doctors for giving me a new life. I was diagnosed as Rod cone dystrophy as many doctors said there is no treatment for this disease in the world but in Sanjeevan a got such a good treatment I am satisfied. 1. I can see better in sunlight. 2. I can even play football. 3. I can read Ishihara plates instantly and easily. 4. Now I can open my eyes fully without any problem. 5. No burning sensation is there in my eyes. 6. My D-15 test is normal. 7. Farnsworth lantern with double light is normal. 8. I have checked HRR plates and now it is normal and I could trace most of the figures. 1. Now I can drive better than before. 2. I can also play football & watch T.V easily. 3. I could traced Ishihara easily. 4. Now my partial vision is 6 x 24 without glasses and with glasses is 6 x 6. 5. I am waiting for more improvement to come. 2. I can play football very well. 3. My vision is improving & I feel better now. 1. I can drive easily. 3. Vision improved & improving. Thank you Dr. Uncle & Dr. Aunty for your kind support and love. This is Vishal. At first you are God in our life and whatever I am is all because of you, I got good improvement in my eyes. Now I can drive car without wearing specs and can watch T.V also. Once again I am most grateful to you with all of my heart for your kindness and continuous support. After taking Accupunture and doing exercise I can see better & clear. What are the things I can do? 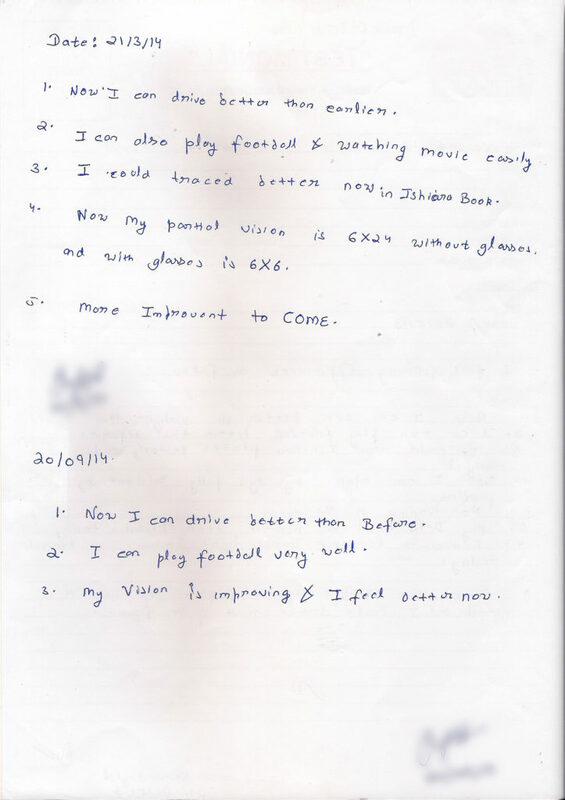 Everything, I can drive, I can read, I can play football, can walk very easily and I am sure one day I will say good bye to my glasses & of course this disease. Thank you Doctor uncle & doctor aunty for giving me a new life.I am very thankful to you. From last 8 years I am suffering from Retinitis Pigmentosa (R.P.). RP came with its all symptoms like photophobia, night blindness &colour deficiency. My vision started decreasing gradually & it had becometunnel vision. I was able to see only through central part of my eyes .I was not able to move in sunlight, couldn’t realize depth while walking & my life became dependant. Then I came to know about “Sanjeevan School for perfect Eye Sight”. I consulted with DrK.K.Goyal&SumanGoyal. They told me, your vision will definitely improve. This is first positive thing I foundhere because other doctors were saying we will try. This ‘definitely’ word made lots difference & today it is proved. 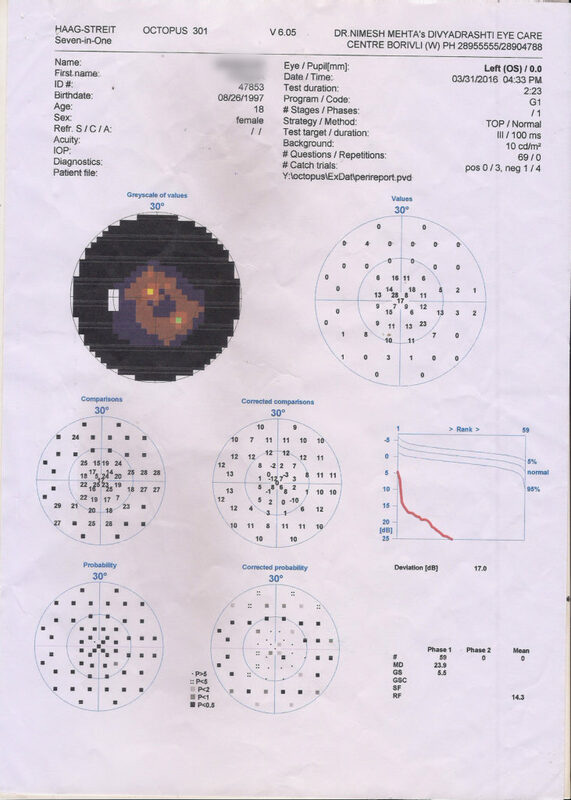 After starting this treatment my vision started improving day by day .Now it is improved more than my expectation.My photophobia is totally gone, I am able to move in sunlight even my side(Peripheral) vision is improved. Evencolour vision is good and life is become independent. Today I am leaving this Sanjeevan not only with better vision but also with confidence that I am able to see like normal person. Now world is beautiful through new vision. Thanks to Suman Madam &DrK.K.Goyal for their immersed guidance, without them it was not possible. Last but not least thanks to all staff of”Sanjeevan” who helped me during my exercise & made my all sessions enjoyable & memorable. I was suffering from Retinitis Pigmentosa due to which it was very much difficult for me to walk from one place to another.I had become dependent on someone for walking .I went to many doctors and hospitals. There was no hope left. Then I got to know that treatment for this eye disease is available at “Sanjeevan” and I met DrK.K.Goyal&SumanGoyal. 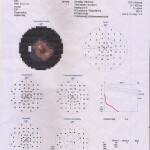 Because of their proper guidance and treatment my Eye Sight became better and I was able to see clearly. I was here for 23 days. Inthese days I got full co-operation from all the staff. Here all are very good and every body been taken care properly. Hi I am from Kerala. Before taking the “Sanjeevan Treatment” my right eye had only 6/18 vision. That why I could not see anything at far distance. 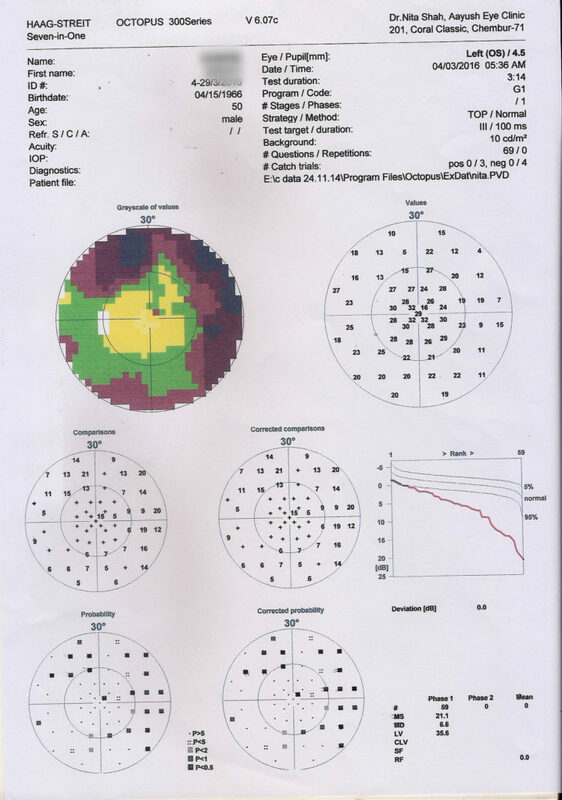 I went to so many doctors and also for operation to increase my right eye vision but finally I got only one answer that this Is due to genetic problem .It is not possible to improve my right eye vision. I made lots of friends and would like to thanks whole staff of” Sanjeevan” .